Randomized Zones give you the ability to load up custom games that can be shuffled and randomized. Randomized Zones can be found under the Zones tab in the side menu. — Click the Randomize button and draw a box with the LMB and box select to create your new zone. 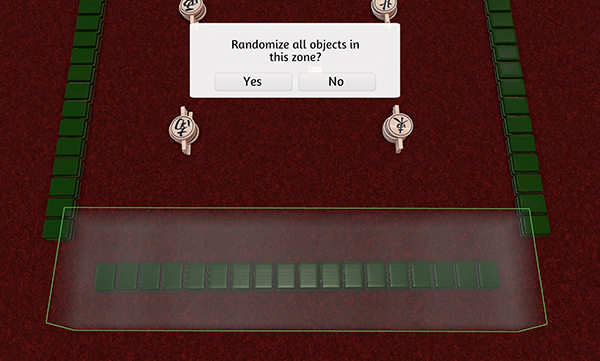 When you let go, a “Randomize all objects in this zone?” message will pop up. — When you load up your game, the message will pop up and you can choose to randomize it or not. — Additionally, you can right click on a zone and the message will pop up as well. — Any object in this zone can be randomized. — This is good for tiles, cards, memory type games, and much more. — When you go back to normal mode, the zone will not be visible, so you can create a special mat or anything you so desire to let this area be known as a special zone. — You can create multiple zones. — You can rotate, scale, resize and move zones with the Gizmo Tool.